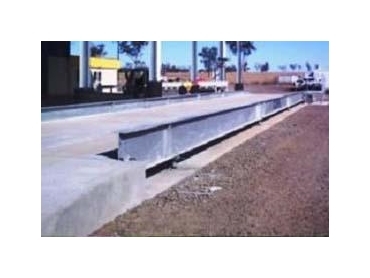 Accuweigh’s QWM branch in Brisbane recently supplied a concrete deck weighbridge to Stocklick Trading in Roma. The concrete deck weighbridge was preferred over the steel option as Roma experiences significant temperature variations from day to night, which impact the end stop clearances of steel deck weighbridges. All weighbridges are manufactured with adjustable end stops, which need to be altered seasonally to ensure end stop clearances are correctly maintained. If the clearances are too tight there is increased risk the weighbridge may bind against the end stops and cause weighing errors. If the end stop clearances are too large, then the weighbridge is prone to excessive end-to-end rocking, which can significantly reduce load cell life expectancy. The huge concrete mass of concrete deck weighbridges acts as a buffer to moderate the amount of expansion and contraction of the steel beams leading to more consistent end stop clearances. The problems of weighbridges with excessive clearances are further increased under heavy truck braking and/or acceleration forces, which place undue stress on the load cell pendles and cups that can then lead to early failure of the cups and the load cells. An early warning sign that a steel deck weighbridge may have excessive end clearances is the constant clatter of the steel decks rebounding off the end stops when trucks are slowly entering or leaving the weighbridge deck. One of Australia’s largest suppliers of weighbridges, Accuweigh/QWM also offers vehicle weighing solutions such as wheel weighers, axle scales and onboard vehicle weighing systems.